Serena Williams is speaking her four-month-old daughter’s destiny into existence. 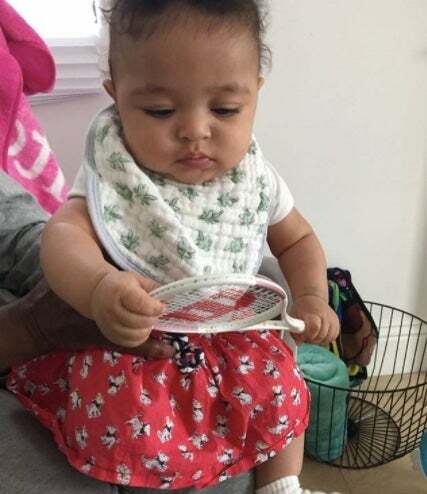 The tennis champ shared an adorable photo of Alexis Olympia Ohanian, Jr. holding a miniature-sized Wilson tennis racket. Wilson Sporting Goods Co. is one of Williams’ many sponsors. We are very ready to watch Alexis grow up to dominate the tennis circuit like her mother, who currently holds 23 Grand Slam championships. Alexis is already the youngest to ever grace the cover of Vogue, so she is already making headway. Williams will be returning to competitive tennis for the Fed Cup in Asheville, North Carolina on Feb. 10-11.